I also like tuna on salad, it's handy to have a can of tuna around in case you run out of chicken. Though I only like one kind of tuna, which Jewel only intermittently has and at the moment does not. Again with showing baby spinach for variety, and baby spinach does keep better than salad mix. So in order of hardiness: romaine, baby spinach, salad mix. Rinse and drain the chickpeas. Whisk the lemon juice with the olive oil, and marinate the chickpeas in the vinaigrette. If you made extra marinated beans when you made quinoa salad, you can use whatever you have and just take them out of the fridge. Trim and dice the yellow pepper. Halve, pit, peel, and dice the avocado. 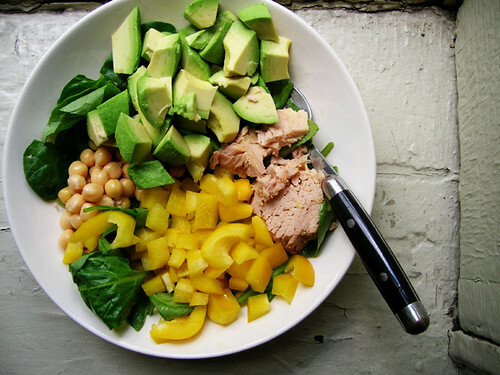 Make a bed of avocado and baby spinach, then top with tuna, marinated chickpeas, and peppers.